The climate of St. Croix is coveted as one of the most consistently beautiful in the U.S. Virgin Islands. Its Danish ancestry is reflected in the local architecture, and belies a deep history stretching back to the fifteenth century. With great weather, charming scenery, and fun attractions in the day and at night, St. Croix makes for an excellent private flight destination. So you’re bound to have a great time regardless of what brings you to St. Croix, and the best way to get there is via luxury private jet. Virgin Islands Jet Charter is the best company to help you get in and out of St. Croix comfortably, efficiently, and hassle-free. Our Wyvern certified jet charter representatives have experience working with all sorts of clientele. Whether you’re a top-tier business executive taking a week off or a seasoned jet charter traveler hoping to check out your favorite beach-side bar, we’ll make sure your next flight is the best yet. Our St. Croix Jet Charter representatives are available 24 hours a day and 7 days a week to ensure that your needs are met exactly when they need to be, and can arrange just about anything upon request. Whether it’s a multi-leg private flight with gourmet in-flight catering or luxury ground transportation and private helicopter lifts, we can set it up. So request a quote now or give us a call to book your private chartered flight to St. Croix, U.S. Virgin Islands. Private jet travelers in St. Croix will find that the sun shines year-round on the island, and gives birth to lots of resorts with breathtaking views and fun beaches. When it comes to St. Croix resorts, the list of possibilities is practically limitless. Ranging from top-tier resorts and contemporary hotels to charming bed and breakfasts and boutique villas, the list is sure to have something that’s just right for you and whomever you’re traveling with. If you’re a beach bum, we need not say that you’ll find the most amazing beaches you’ve ever seen on St. Croix. For instance, the Divi Carina Bay Resort, the island’s only all-inclusive resort, is sequestered on the eastern side of the island. Its Caribbean charm sits nicely in conjunction with modern amenities. These charms come hand in hand with never-ending nightlife options and world-class gaming. Another highly recommended option is the Chenay Bay Beach Resort. With thirty acres of beautiful scenery peppered with fifty Caribbean-style cottages, the Chenay Bay Beach Resort is sure to set you up for a great Virgin Islands vacation. Regardless of where you stay on the island, a great time awaits you and whoever you travel with. But there are some places that stand above the rest. So, you should keep reading if you’re having a bit of trouble deciding. Our list of the best lodgings for luxury private jet travelers is based on client feedback and online reviews, so it’s sure to have something that tickles your fancy. At 84 square miles, one can imagine that there are plenty of things to do in the Twin City for private jet travelers. And with a documented history dating back to 1493, St. Croix is full of historic sites and academic attractions that will interest private travelers of every background. So whether you’re an outdoorsy adventurer or a night fuel burning partier, you’re sure to have a great time in St. Croix. But of course, the biggest attractions on this iconic island are the beaches and the reefs. You’ll find that the area around the island is also full of fun things to do. The snorkeling is some of the best on the planet, as is the diving. There are also a ton of rock and coral formations that make for great day trips. For instance, you’ll see lots of naturally formed bubble pools throughout the island. These rock formations make for a great afternoon with your fellow travelers, hiking out the locale, and then enjoying a few drinks while the surf turns your natural pool into a bubble bath. If you’re a private jet traveler who prefers to stay up late and sleep in during vacation, then St. Croix has plenty in store for you. With bars galore, and live music and specialty shows just about every night, you’ll have plenty to keep you busy while you burn the midnight oil. The most popular venues are St. Croix’s vaunted beach bars that pepper the coast line. Of these, a few stand out as the most fun and interesting. On the island’s East End, you’ll find the ever-popular Deep End Bar & Grill at Tamarind Reef. Family owned and operated for the past several decades, this bar knows a thing or two about drink slinging. Now that you have a couple venues in mind for either a daytrip or a nighttime outing, you may be ready to set up the itinerary for your trip. Well to help with that, we’ve compiled a list of the absolute best attractions on the island for private jet travelers. Based on jet charter client feedback and online reviews, there’s sure to be something on the list that’s right up your alley; read on to check it out. Home to the Millennium Monument, Point Udall acts as the Easternmost point in the United States and makes for a great photo op. This iconic attraction has been a “must-see” destination since the early 1900’s. 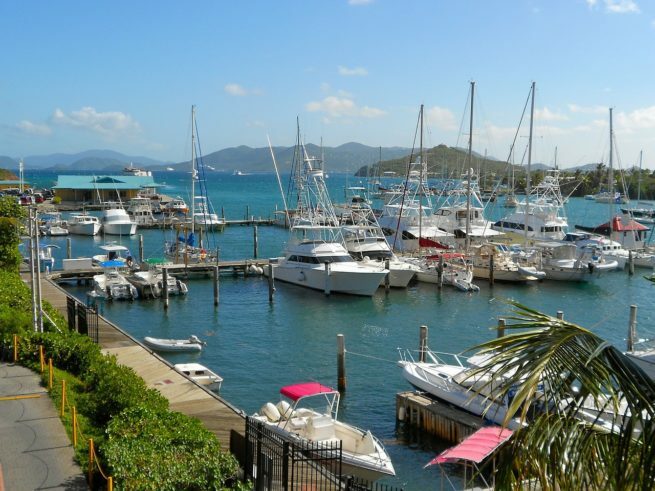 It delivers the best sunset views of anywhere in the Virgin Islands, and hosts several special events throughout the year. Considered to be the number-one adventure and hiking destination on the island, the Carambola Tide Pools are often described as breathtaking, and astounding, by every visitor. Air Charter Virgin Islands utilizes the following airports to fly clients privately to/from St. Croix and neighboring Caribbean Islands. Request a Quote or give us a call at 1-888-987-5387 to speak with one of our St. Croix Private Jet Charter agents for your next luxury vacation, business trip, or special event.